On Easter Sunday 1772, the Dutch navigator Roggeveen sighted an island located on the eastern most edge of Polynesia and named it for the holiday. Easter Island is famous for its prehistoric stone statues. There are over 600 of these statues and some were given names such as "Twisted Neck" and "Tattooed One." The backs of some of these statues also bear detailed designs, which appear to represent tattooing. Marquesan Islanders settled the island during 400 A.D. Although Easter Island tattoos did not reach the same heights as the Marquesas, they were still impressive. Motifs included stripes, circles blocked in squares, triangles, interconnected hook forms and open square and points. 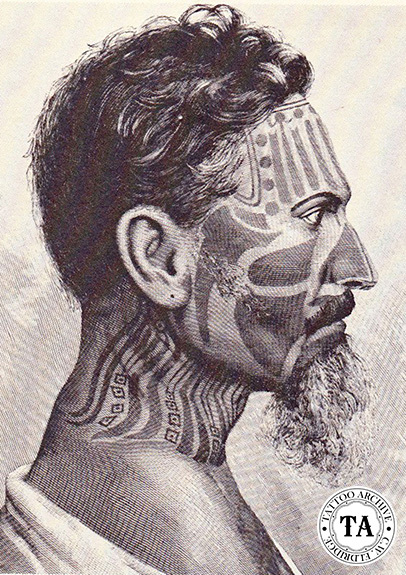 The face was the focal area for the tattooist with the head being the most sacred (tapu) part of the body. Tattoos were extended to the shoulders, upper back, buttocks and thighs with the designs on the arms having the least amount of detail. Tattoos on the back and lower body were predominantly broad areas of dots, crosshatching and panels of narrow vertical lines.